When it comes to small apartments, as a general rule designers follow a standard scheme – pick a few comfy light colors and dilute them with a few bright accents. 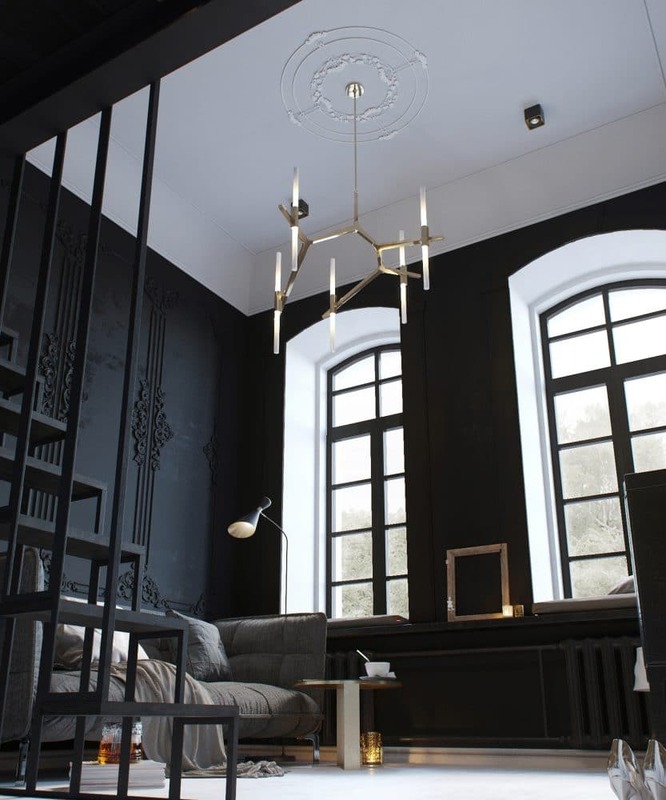 In today’s apartment the choice was set upon a somewhat unexpected hue for a tiny space – total black. And the result appeared to be absolutely impressive and gorgeous. In Russia old houses of the Stalin era are sadly famous for their absolutely inconvenient layouts and tiny areas. At the same time, solely in apartments of that time you can find the highest ceilings and the biggest windows. 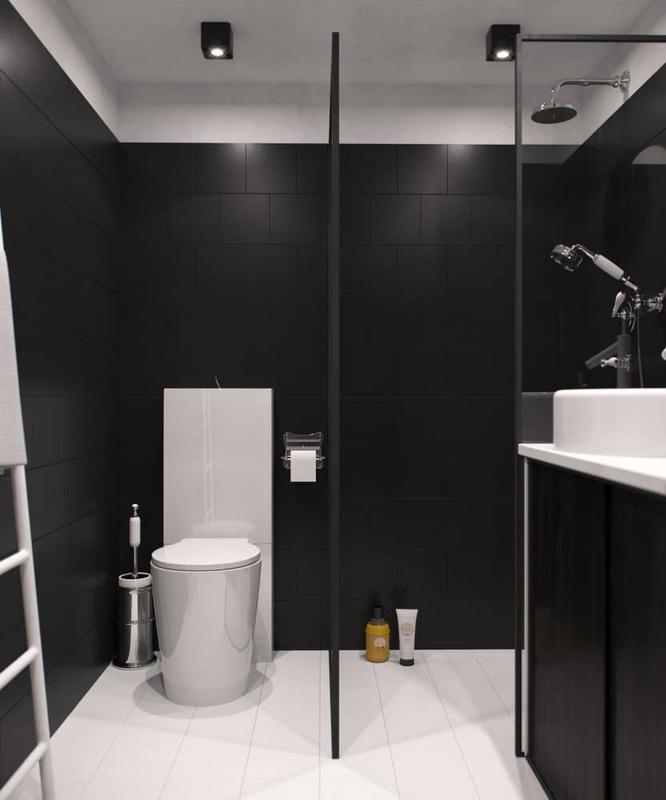 These two advantages played the key role in implementing a bold designer’s idea – creating a monochrome black interior. 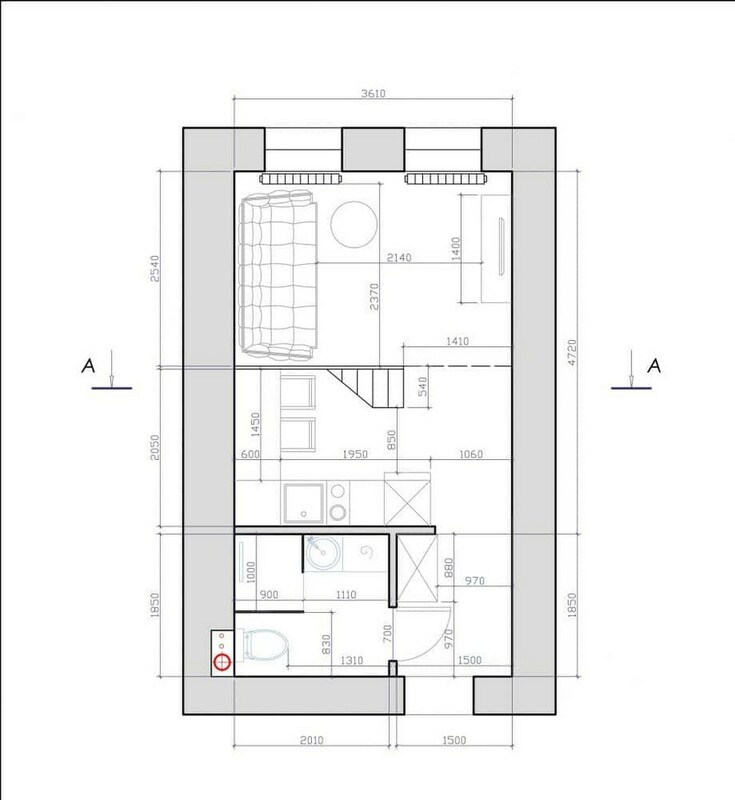 The ceiling height of 3.8 meters on a total area of 24 sq. m. creates the so-called “well effect”. By efforts of a professional designer this drawback was turned into a big plus of the flat – it allowed to split the space vertically. In the end the apartment got a mezzanine floor and new useful area, and its masters escaped the feeling of living on the bottom of the ocean. Thanks to new areas, the flat managed to include all necessary functional zones for full-fledged living. 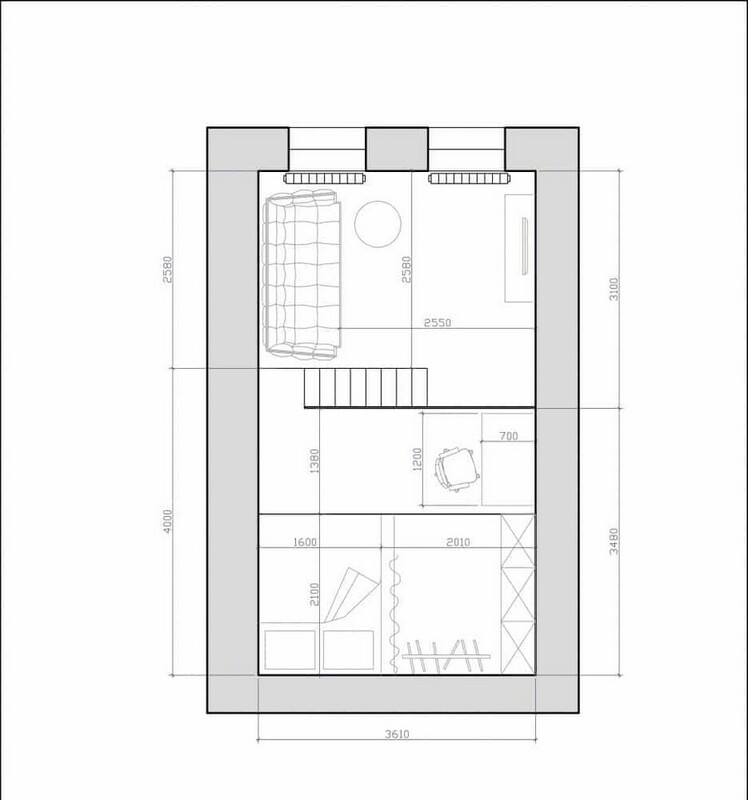 The first level included an entry area with a big wardrobe for seasonal clothes storage, a bathroom including a big shower cabin, a lounge zone featuring a big sofa and a TV-set, and a tiny, yet functional kitchen. 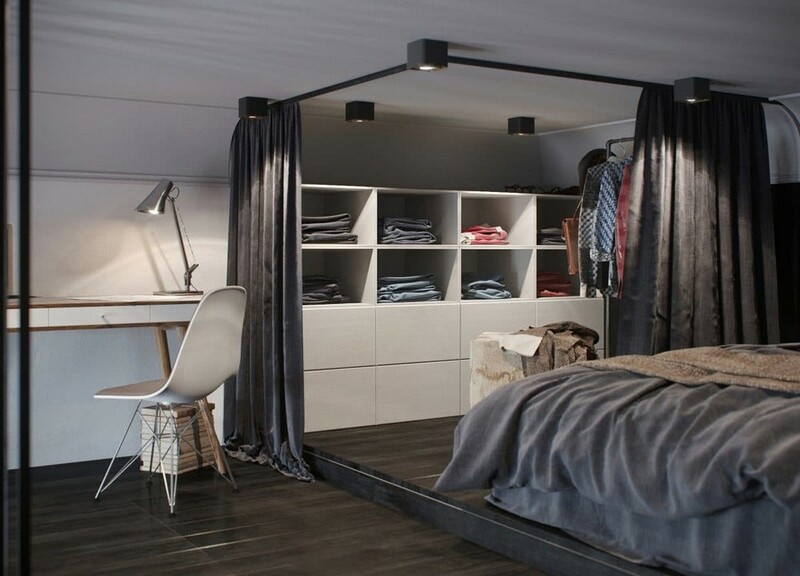 The second level comprised a bedroom with a big bed, a curtained closet zone, and a small work area. The re-made layout made the hostess extremely happy, since earlier she had to sleep on a folding sofa and badly lacked storage areas. As we already mentioned, the primary interior color is black. 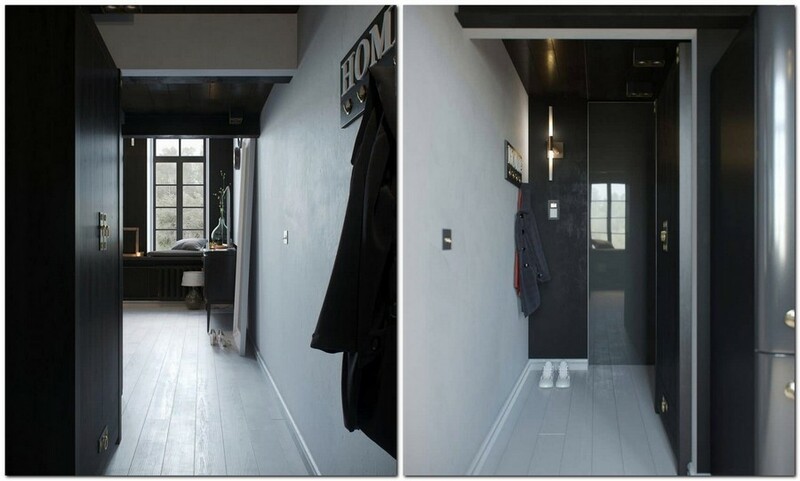 To make the space look less dull and non-cluttered, it was coupled with white oak flooring and show white ceiling. And one more little designer trick was used to make the ceiling look lower – a 30-cm-wide crown molding of the ceiling color. It goes without saying that such a peculiar interior design required a well-though-out lighting system. A few lighting sources giving warm color temperature were arranged around the flat: a floor lamp by the sofa, a desk lamp next to a TV stand, a big chandelier and a small bedside lamp. But primary artificial lighting of neutral color temperature is also foreseen: a few powerful spotlights can be turned on to illuminate the entire flat. As for the furniture, most of it was custom-made: in small apartments every inch is precious, and finding the right readymade variant is quite challenging. One of the best custom-designed pieces is a kitchen set. 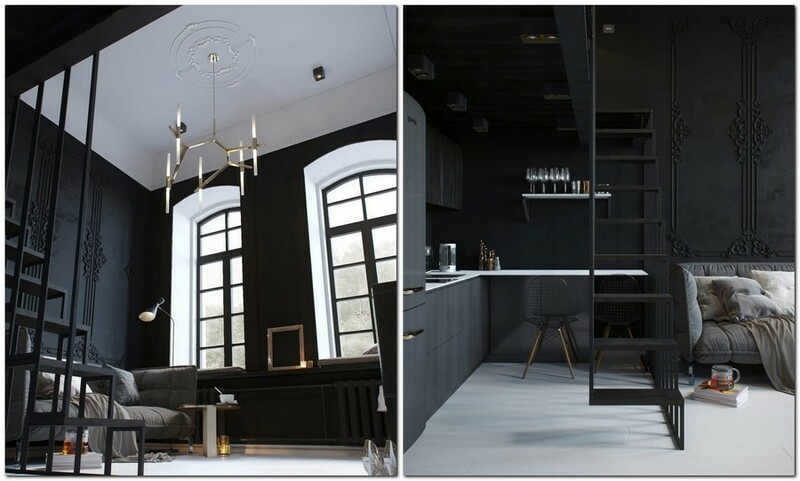 Its base cabinets are made from painted MDF, upper ones – from black-painted veneer, and the centerpiece is a retro-style refrigerator by Gorenje. A TV-stand for the lounge zone is bespoke, while a sofa and a coffee table are made by a famous brand B&B. In the bathroom reserved Germans made friends with delicate French – sanitary porcelain is made by Duravit and water taps – by Volevatch.